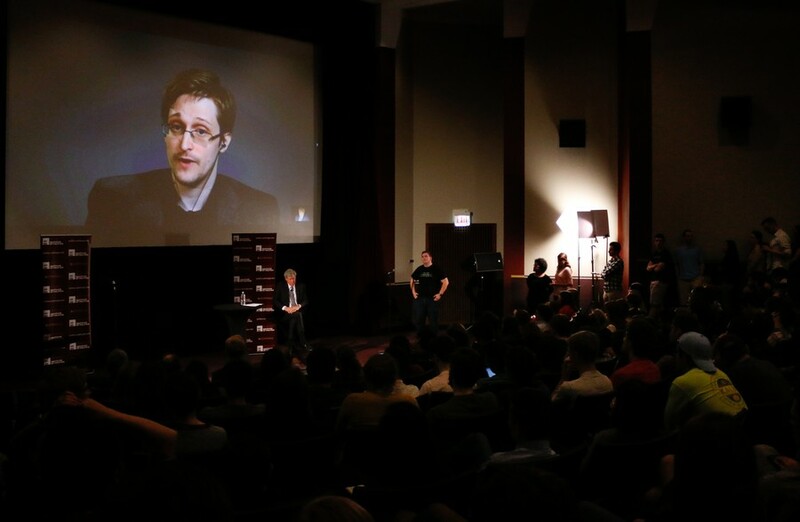 Whistleblower Edward Snowden discusses surveillance, privacy and American democracy over a video call in Max Palevsky Cinema on May 12. Whistleblower Edward Snowden spoke over video call yesterday with one of the men President Obama asked to recommend an official government response in the wake of Snowden’s 2013 data leaks. The IOP-sponsored event was hosted in Ida Noyes Hall by University of Chicago Law School professor Geoffrey Stone. In 2013, Stone served as part of Obama’s Review Group on Intelligence and Communications Technologies, a five-man panel created in light of revelations by Snowden and others of potential surveillance technology abuses by the United States Intelligence Community (IC). The panel’s recommendations included creating an agency to help whistleblowers voice their objections and creating a new federal oversight agency to ensure the protection of civil liberties. In a January 2014 interview with The Maroon, Stone referred to Snowden as a “criminal,” but expressed ambiguity over whether he should be punished. Snowden began the discussion with a brief account of how he came to work for the NSA and how his concerns over the abuses he felt he was witnessing steadily mounted over the last years of his career. “I saw that [the IC’s] public claims had become entirely divorced from the private realities of how things work in the intelligence services in the United States,” he said, referring to statements made by Director of National Intelligence General James Clapper during a 2013 Senate hearing denying that the NSA collects Americans’ data on a massive scale. Snowden cited that hearing as the moment that ultimately convinced him to take action, leaking almost 10,000 classified documents to the media. Snowden justified his actions by arguing that the only oath he had actually taken as part of his intelligence career was to uphold the U.S. Constitution, and while he was aware of the illegality of his actions he believes that his obligations to democratic principles were greater. “Our governments—open, liberal, western democracies—tend to derive their legitimacy, their ability to pass laws, to enforce policies, on the principle of the consent of the governed, but as anyone in this room could tell you, consent is only meaningful if it is informed,” Snowden said. Throughout the discussion, Snowden emphasized the difficulties facing potential whistleblowers because, as in the case of earlier whistleblower Thomas Drake, they cannot base their legal defense on whistleblowing or public interest and risk losing their entire careers and livelihoods. Drake is a former senior executive at the NSA who lost his job and was prosecuted for mishandling classified information in 2011 after he communicated discomfort with Agency policies to members of the media and was later found to have several classified documents at his home. Snowden suggested that the internal complaint system should be made simpler and less hostile. Responding to an audience question about perceived apathy toward his revelations, Snowden attributed that trend to a feeling of limited agency in the face of complex and inaccessible technical systems that leads people to see change as nearly impossible. Snowden also attacked the view that privacy is unimportant if “you have nothing to hide” on the grounds that it is a fundamental part of self-determination, especially for those not in line with societal norms.